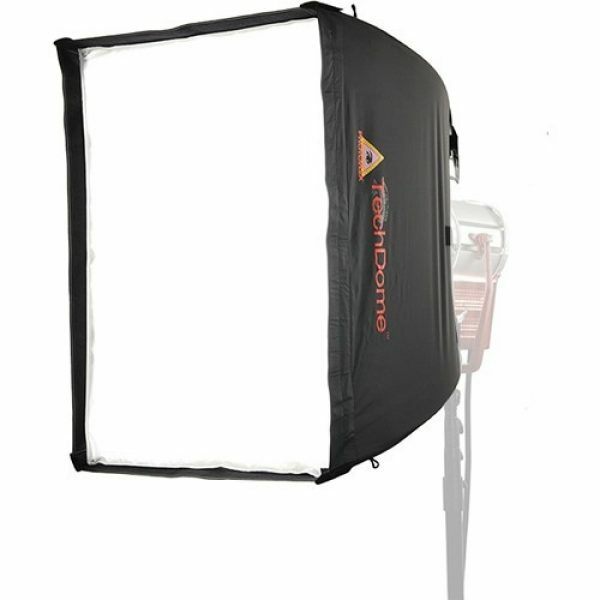 LED lights run much cooler than their predecessors and the TechDome fabric is lighter weight, the same material used on Photoflex LiteDome Strobe Softboxes. The internal diffusion baffle eliminates extreme highlights and hotspots and, along with the diffusion face, is removable allowing you to go from soft, diffused lighting to high-contrast without changing your setup. The rear opening of the TechDome accommodates larger diameter video connectors such as the Photoflex Large VC-ADJUST3LB Adjustable Video Connector, the VC-B13.5 Circular Connector or the large diameter Chimera Circular Speed Rings. Also, the inclusion of rod extenders allows its use with smaller diameter circular video & strobe speed rings. The patented Quick Release Corners (QRC) enable easy setup and teardown. TechDome soft boxes are compatible with optional grids, giving you great control over light direction. Loop hooks are sewn into the outside of the dome to allow for hanging the soft box from above. 24 x 32 x 21"